This packet has been revised as of October 22, 2015 using the 2014 Teachers Edition. The writing sheets have not changed, but the vocabulary cards and writing sheets now have page numbers that match the 2014 edition. This packet contains the following on a PDF format and all items have been copied onto a Smartboard version. 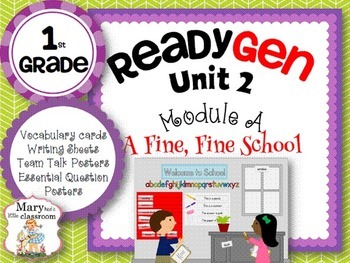 This packet contains all the vocabulary cards needed for Module A of Unit 2 of ReadyGen First Grade. The cards are printed with colorful graphics and definitions and have the numbers printed on them of the lesson numbers, Teachers Edition pages and the pages where you can find them in the books A Fine, Fine Day and The Recess Queen. 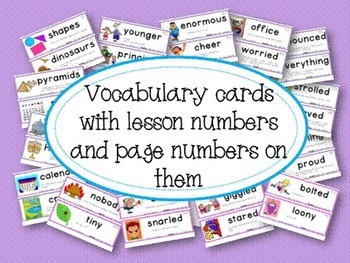 It contains 10 pages to make student Vocabulary Picture Booklets of the Benchmark vocabulary words. See the preview for an example. 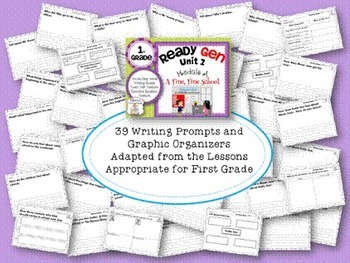 There are 39 pages of writing prompt sheets and graphic organizers (mostly writing prompts) to choose from. These I adapted from the lessons and made them very appropriate for first grade, with larger print and enough space to write and illustrate. You can see samples by downloading the preview. 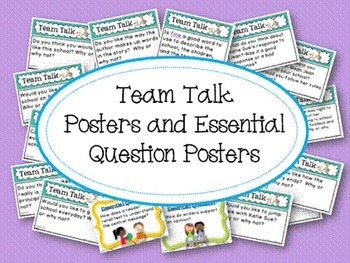 There are also 13 Team Talk posters and 13 Text Based Conversation posters (which is part of the focused reading section in each lesson) and 2 Essential Questions poster. The file name for this zip file is too long. It is difficult for me to change the file name from the original name. Opening the smartboard version will be no problem. However, when you open the PDF file, it may say "destination path too long, rename file and try again". Just rename the zip file and save. You should be able to open it easily. There is an explanation on how to do this in the zip file.